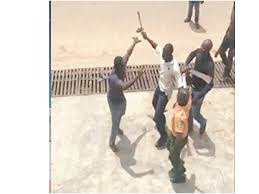 At Ilasamaja yesterday, as some officials of the Lagos Environmental Sanitation Corps (LAGESC), attacked hapless civilians with machetes. A witness, who gave his name simply as Tony, said for several hours, the officials, armed with machetes unleashed hell on the area, causing passers-by, motorists and residents to scamper for safety. The tensed atmosphere snowballed when suspected thugs suddenly grabbed machetes, sticks and bottles and confronted the LAGESC officials, routing them. One of those alleged to have been attacked by the LAGESC officials, is identified as Jelili, a vulcaniser, who has speech impediment. “The commotion started about noon. The LAGESC officials, who came in two lemon coloured trucks, arrested some street traders. Those arrested were put in their Black Maria. People started hurling stones at them. One of the stones shattered one of their trucks’ windscreens. This clearly angered some of them, who jumped out, armed with machetes. They pounced on anyone on sight and started attacking them with machetes. “A vulcaniser was also attacked. For about 10 minutes, these LAGESC officials took control of our area. Some minutes after the attack started, angry street urchins mobilised and armed themselves with machetes, bottles and sticks. “When the LAGESC officials discovered they were outnumbered, they entered one of their trucks and escaped, abandoning the second truck. Not more than 30 minutes later, policemen from Ilasamaja came to the scene. I later left, headed for office; but neighbours called to tell me the LAGESC officials returned with re-enforcement and policemen,” another witness said. The state Police Public Relations Officer (PPRO), CSP Chike Oti, said the LAGESC officials were on duty. He said: “What happened was that LAGESC officials came to Ilasamaja area to carry out an operation, which was to arrest cart pushers. They couldn’t contain the situation, there was trouble and when the situation got out of hands, they quickly alerted the police. The police raced to the scene and rescued the LAGESC officials and took them to the station. “The hoodlums teamed with cart pushers and went berserk. Most of these street urchins are fond of seizing any opportunity to cash on any situation. These hoodlums always look out for opportunity to foment trouble. We arrested the situation by mobilising a lot of policemen to the scene. We brought the situation under control and restored normalcy. We arrested about 15 hoodlums.